well, I can hardly be defined "hysterical": I am sorry if you felt hurt by the exclamation marks. And obviously I have no clue how the software works. And finally, being 50 this year it is clear that sw is smarter than me. BUT: the important thing is that I could listen to Mood for a day and The clap live for the first time in my life and it was well worth it! 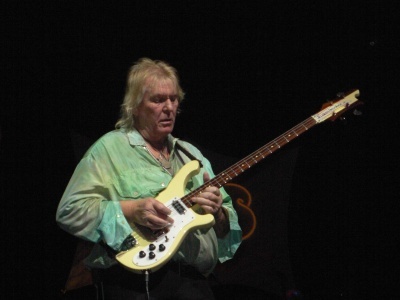 'Steve Howe solo' is just a placeholder for me to insert Howe's actual solos as I learn what they are. Obviously when I know the actual solos he played, I replace 'Steve Howe solo' with those songs. The software isn't smart enough to realize that 'Steve Howe solo' and 'Mood for a Day/Clap' are the same thing. It just compares today's setlist with yesterday's and if there is something missing, it is listed as 'dropped'. So don't get hysterical about it. Be smarter than software OK? PS: Steve's solo was not at all dropped!!!! Who said this? Anybody knows if there's any recording of this gig? 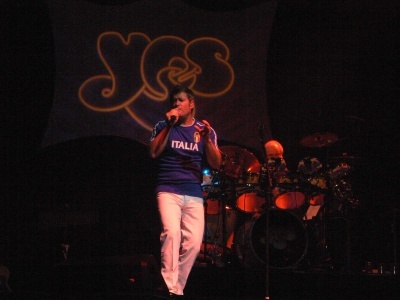 Well, I am a Yes fan since the 70's so I could not miss this one, considering that the previous Yes concert I attended was the Symphonic one in Milan Palavobis in 2001 (!). First comments on the tracklist: I personally do not like the Drama songs, so I would have liked to hear some other pieces from the classical or even from the Ladder-Magnification period. 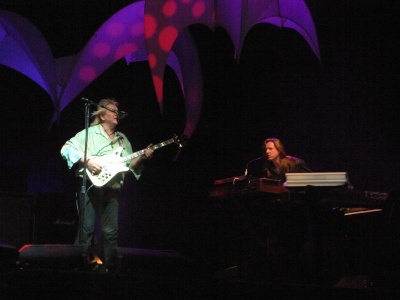 Second comment on the line-up: I don't know if anybody had ever heard about Benoit before this tour and I am not sure also about what kind of musical proficiency (not just technique, I am talking about creativity) has been shown so far by the young Wakeman. I think that it is impossible to substitute Jon and Rick in a "soft" way: you should probably take a completely different direction (like in the "Drama" days, perhaps). Of course you would not fill the venues, but it would be a more artistically respectful choice, in my humble opinion. 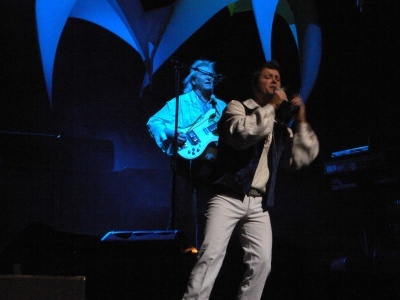 Let us come to the show itself: 2.15 hours without interruption and a continuous display of musical mastery bu Chris and Steve. 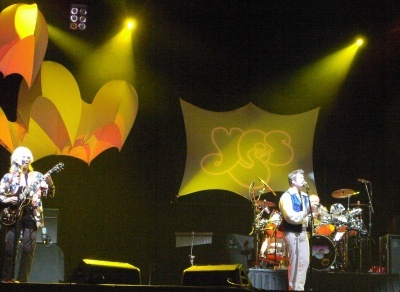 Possibly even slightly better than the last time (2001): it is a miracle how these two guys (who are part and will remain in the history of progressive rock) still keep on playing with amazing energy, precision and apparently effortless. 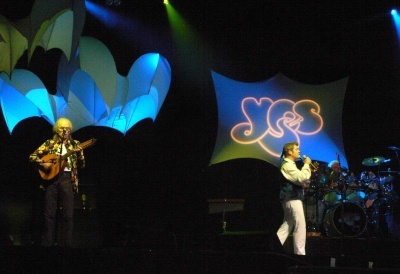 They really like the music they play and it really seems it is part of their lives: you can hear the small nuances in the solos or even in the main parts (and if you are a Yes fan who knows their music well, you can understand what I mean) and appreciate that they can only come up if you are 100% into that music. Great performance by these two amazing guys. I would really like them to write some new stuff in extended suites form: I am sure they would be able now to renew in part the heights of the progressive masterworks of the past. Of course this caanot be achieved withour Jon's spirit and compositional contribution, and this leads me to speak about the less convincing areas of the show. Benoit David did a honest job, but just as an "impersonator". His vocal range is obviously not equal to Jon's (perhaps this is impossible), but nevertheless he could manage most of the vocal dynamics. However he did not transfer to me any particular emotion: when I heard Jon singing (even with some imperfections) I received plenty of what once we used to call "good vibrations". Last friday it was not at all so: a well prepared replica (with some good help by Chris in some awkward peak parts), but no magic, no charismatic touch to me. And similar comments apply to Oliver, too. OK, he had lots of technical troubles with his keyboards, but I bet any sum that had Rick been there, he would have found, created some ingenious musical solutions and not just done his homework in a reasonable way. I am not criticizing these two guys (Benoit and Oliver) because I am sure they did their best to please the audience and respect the music, but Yes music does not nee respect to be sung and played: it needs love, and I could not feel this love from their side. The two newbies seemed to me really like the newcomers in a team or in any group: careful not to make mistakes and not to take any special initiative that could be blamed, and always one step behind (musically speaking) the two giants. Last lines for Alan: he started a bit slowly, but then improved his performance until the final pieces, where he was OK. I think he played better in 2001, but nevertheless he has that involvement to this music that enables him to still cope with it even if with effort on some occasions. 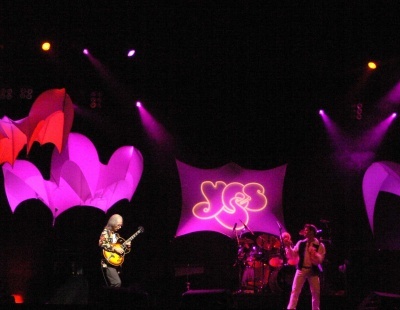 All in all the show was very enjoyable, although it missed part of the aura that Yes music still has for me: I hope to hear new pieces soon from the full Yes lineup and possibly to see them together once again: maybe next year? For me this is the first time that I saw Yes! I really found the concert incredible,the sound was perfect and the theater had an incredible sound. 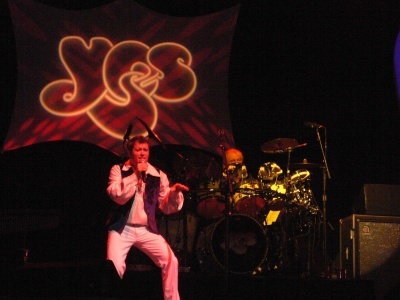 I really enjoyed the song list because there was a lot of yes classics,like "Siberian Khatru","Yours is no disgrace" the incredible "Roundabout" and also "Tempus Fugit"! 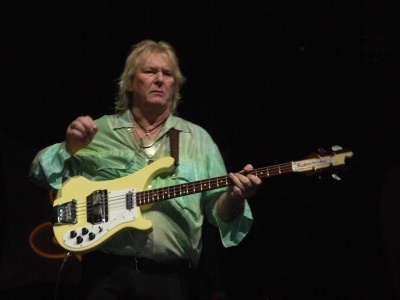 !In other reviews some sayed that "Owner of a lonely heart" was bad,but I really appreciated it!I also liked very much Benoit David for his vocals,really similar to the ones of Jon Anderson,Oliver Wakeman was ok,Steve Howe was,as always,amazing.Also Alan White is amazing,a really solid drummer,he had never lose his touch,really good his drum solo in "astral traveller.Chris Squire,well,I'm a bass player and he's one of my hero,his Rickenbacker an the other basses have a fantastic sound,(the one used in "Machine Messiah"was beautiful)Chris is an unique bass player! 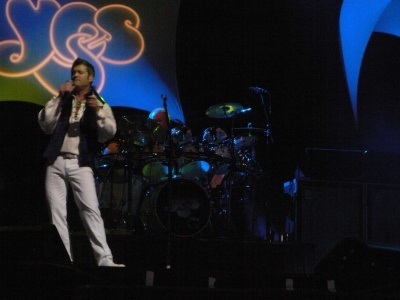 I was expecting to listen also "Starship Trooper" or "Long distance runaround",but I will never forget this concert! Yesterday it was a good show! 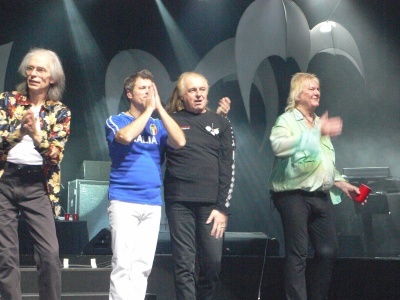 Probably they played better than in Vicenza (apart some problems with Wakeman's keyboards), Chris Squire was quite ok, and Steve Howe was fantastic. 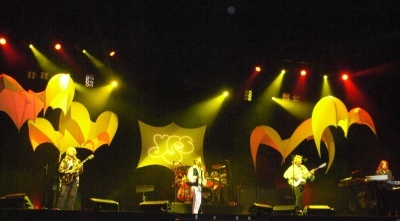 I liked the songs from Drama, so at lest we had the opportunity to hear them played live. 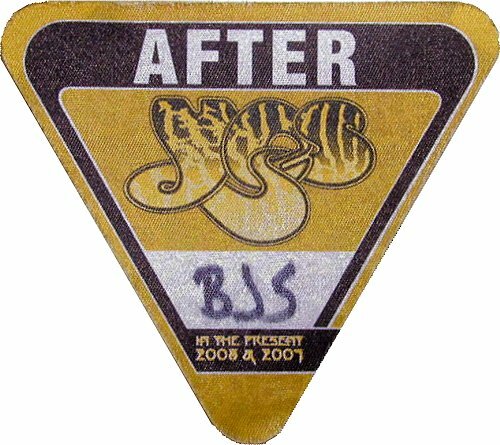 But, sorry I didn't get the feeling: when there was Jon I was breathtaking, and I remember seeing the shows with my mouth open. However, let's see if they'll record a new album. 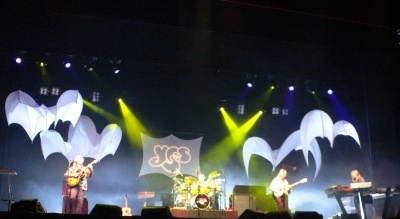 It's not my first Yes show and I hope not the last one. 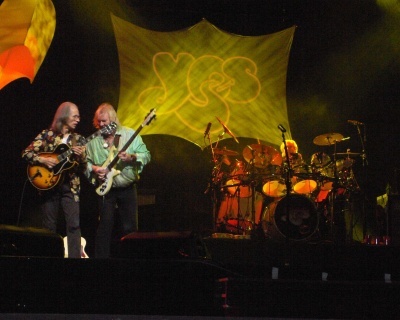 Yesterday night Yes done a very good show, in my opinion. 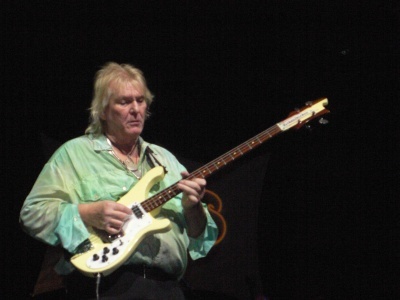 The first part of the show seen Steve Howe as the absolute leader with his technique over the edge and his young spirit, but in the second part of the show Chris Squire become the train of the rhythm, trying to captivate the attention of a tired Alan White. 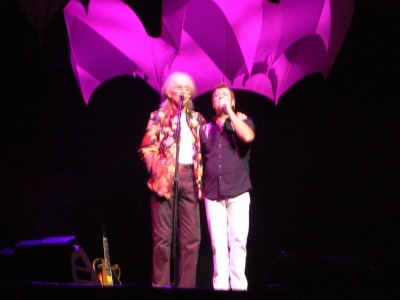 I read a lot of critics about Benoit David vs. Jon Anderson but they are all garbage: yes, Jon is Jon but Benoit David done an excellent job in singing quite all the songs, Heart Of The Sunrise above all, maybe only Owner Of A Lonely Heart under the night standard. 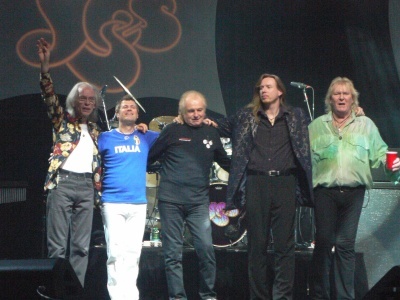 "Owner" is not a song of this line-up, it isn't in the Steve Howe capability - Trevor Rabin has another style, and usually I don't love the way Steve plays the guitar solo but yesterday it sounded acceptable, with a bluesy feeling. Definetely "the show must go on"! I need to listen to new songs from this line up, but the show is a good starting point! 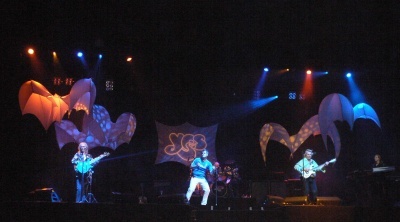 Strange feelings..indeed the core of YES instrumental music has always been Bass, Guitar & Drums; Benoit is good but he is a mere "actor" and YES eventually are now a body deprived of its soul (Jon Anderson)..of course Rick added that extra element that made such a line up unique. The best and most convincing track was Machine Messiah, perhaps not a coincidence given what I have just written above. Hats off to ALL of the guys in the band, but in my opinion, if this line up is going any further, they should release a new album and perform new songs as soon as possible in order to give a full idendity to the band. But this said, I must say as well that frankly Alan looks and sounds a bit tired, poor great Alan he cannot do miracles, affecting a little bit the whole performance here and there and therefore and otherwise my humble advice is the following: bring back Jon and Rick and do shorter tours in bigger arenas, like Genesis did in 2007, with 15 dates or something and with longer gaps between dates where Jon (and Alan) could possibly cope and rest in between shows. Great show!! 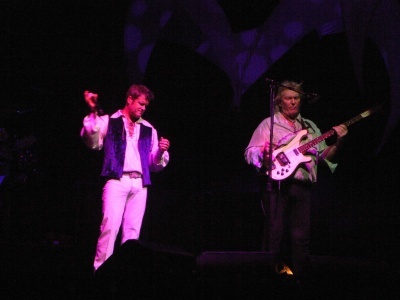 The band played very well .My mind has metabolized the absence of Jon and I enjoyed much more than that in Vicenza . 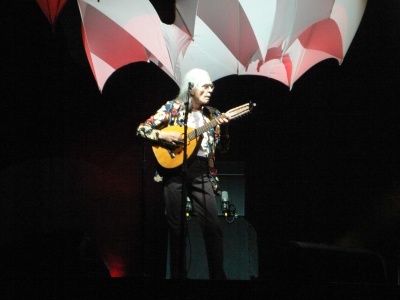 Benoit sang better, and is aware of its role in the band. Oliver has done a good job. Alan as always played well. 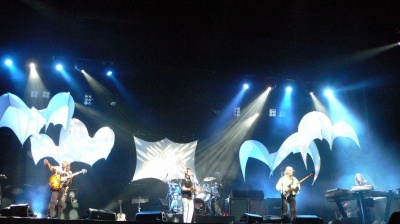 But Yesterday, Chris became the same of last italian tour (2004) and the show was better (compared with Vicenza's show) . 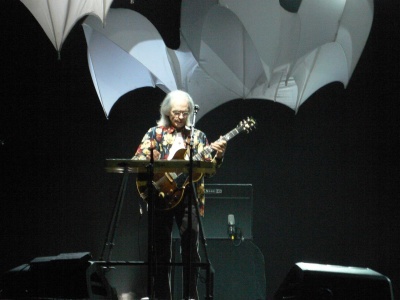 I love Steve Howe and, for me, is the engine of the band. A perfect engine. Teatro pieno, ero incredulo: passano gli anni, la formazione � veramente rimaneggiata ma questi fanno sempre il pieno (ovviamente relativo alle dimensioni della location). Scaletta: rispettata la scaletta se non erro, solo Roundabout come encore. - Pubblico: veramente "caldo" rispetto alle aspettative, tiene il tempo nei punti giusti, applaude convinto e a lungo, apprezza i rimpiazzi nella formazione. 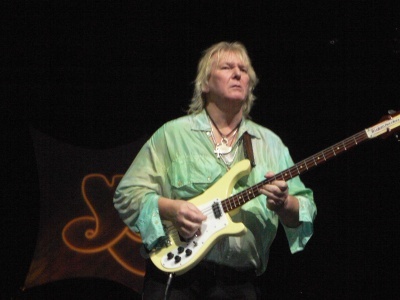 - Chris Squire: Prende la formazione sulle spalle (larghe): si sente responsabilizzato, suona bene, � convinto, imprime energia, canta forte le sue background vocals. - Steve Howe: � sempre lui, non risente degli anni che passano. Molto accurata la versione di "Clap". Suona con molto entusiasmo e resa i brani di DRAMA. - Pubblico: prog-nerds quasi tutti...mamma mia che brutti siamo! Ma � possibile che questa musica la ascolti solo chi veste male, invecchia peggio ed ha la pancetta? - Alan White: scoppiato. Probabilmente deve amministrare le energie, cos� suona come un pensionato in convalescenza. Anzich� tirare, fatica a stare dietro ai brani. - Oliver Wakeman: a quanto pare non basta un cognome per essere il tastierista degli Yes. Parti semplificate, suoni poco azzeccati, volumi spesso sballati (alti, purtroppo). Poco pi� di un buon dilettante. Roba da far rimpiangere Koreshev, il che � tutto dire. Grande pasticciaccio in Yours is no disgrace, con parti e suoni sballatissimi...d� la colpa al tecnico (che forse � Will Alexander...in tal caso avrebbe ragione ad incolparlo). - Benoit David: per quanto il timbro sia giusto, l'intonazione anche...casca l'asino. Manca la sicurezza e la confidenza che solo Jon pu� avere. Mi sarei stupito del contrario. -Il sound mix: semplicemente brutto. CONCLUSIONE: sempre bello per i fan irriducibili, sempre bello per la band che a quanto pare si diverte e guadagna. Quindi tutto ok.
Ovviamente, i brividi, la pelle d'oca, l'arte e i sogni non abitano pi� qui.